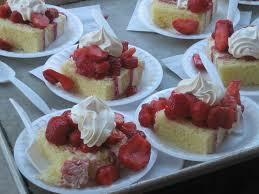 On Thursday, June 18, 2015 Grand Valley hosted their annual strawberry supper. Of course, the planning starts at least 2 weeks earlier, when the lists are made up and passed out as to what is required in food – whether your list involves donating butter, coffee, tea, homemade salad dressing, devilled eggs, jelly salads, or iced cakes. Everyone takes their list and willingly gets ready for the event. The day before, all who are able arrive at the church at 9 am and start to prepare for our dinner. Potatoes are peeled and cooked, cabbage shredded, silverware wrapped, tables and chairs are set up in preparation to being host to the community. By noon, the inside of the church is ready – enough work for Wednesday. Strawberries arrive at 1 pm on Thursday, and the crew is on deck again, washing and hulling the berries. During these work bees there is always laughter and fun as the work is accomplished. This year, weather reports were saying rain would start by 4:30, the time our supper was to start. Regardless of the weather reports the dining tent was erected on our beautiful church lawn – and God gave us a beautiful evening, sunshine and blue skies. What a blessing! People began to arrive, and at one time almost 200 people were eating at the same time – using the setup downstairs in the church and the tables and chairs set up on the lawn. It was such a blessing watching people chatting, visiting and enjoying their evening under God’s great canopy of trees and skies. A beautiful community of people gathered together! Our congregation is so blessed with having eager workers. We reach out into our community with hospitality and love and we are blessed with the community attendance to the dinner; and, our congregation is blessed by them attending. The churches in our little village of Grand Valley have a wonderful compassion for one another and support each other in many activities. Today, Sunday, June 21, our congregation was invited to John and Marlene Black’s new barn for our church service. Many of you know, this is not an ordinary barn. We were so blessed again, Sunday school (with coffee) was led by Ron Yager, from Independence, Missouri, who related the story of his father, Joe, who served as a missionary his whole life in service to Christ. Ron was the speaker for the worship service and brought a challenge to us by relating his life’s stories; and, how we can apply and grow with our own life’s situations. We had a guest soloist, Dorothy Miller, who took part in the service. We were ministered and blessed many ways during the morning. Thank you so much John and Marlene for inviting us to come and worship at your place. Thank you for the many who helped organize the service and those taking part in the service. Of course, we cannot forget the potluck lunch that followed the service, the icing on the cake again was the fellowship we enjoyed. The congregation had a busy week and we have been truly blessed with our activities.